These resources are specifically created to transform your men and your Men's Ministry Now! 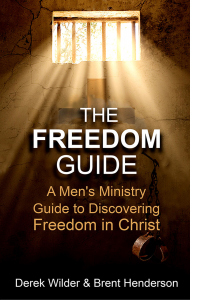 Based on the book FREEDOM: How Grace Transforms Your Life Now, The Freedom Guide and the Freedom Guide accompanying DVD are the perfect tools you need to grow yourself, your men, and your ministry. 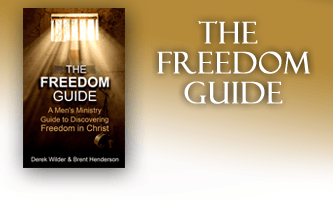 The interactive Freedom Guide (workbook) is filled with areas for exploration, renewal and discovery. This 14 week series will help your men understand who they really are in Christ, how to renew their minds and how to break free from unhealthy thoughts, emotions, and actions. There’s a battle going on and no man escapes it. Every man gets attacked by the lies of the enemy daily and suffers from anger, fear, worry, lust, doubt, anxiety, and past and future thinking. If he doesn’t learn how to overcome these attacks it will destroy his marriage, his family, his job, his mind and his close relationship with God. This 14 week DVD series helps men recognize where their being attacked and how to meet the enemy’s attacks with overwhelming force! 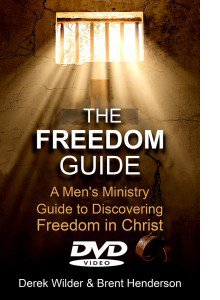 This 14 week FREEDOM Guide DVD series is packed full of honest real-life trials and failures that conclude with a God-life solution. We'll show you how to see the enemy's flaming arrows before he shoots them. And stop them from causing unhealthy thoughts, emotions, and actions. It is truly life changing. Each week you will explore, renew and discover where God is at work and how His grace transforms your life now! I am looking for a Bible study program; geared toward men, for our Men’s Ministry. Is there printed material that can be reproduced as part of the program that includes your DVDs? I have not used the purchase button, but I do need a price for this program. It appears to meet our needs. I will be reviewing it along with a couple of other programs that have been recommended.